The Russian capital has preserved many of its memories of WWII. They include the June 1941 mobilization, the endless air raids and evacuation, the enemy’s withdrawal and the return of the soldiers from the front, and most importantly, the Victory Parade in June 1945 that signified the end of the war. 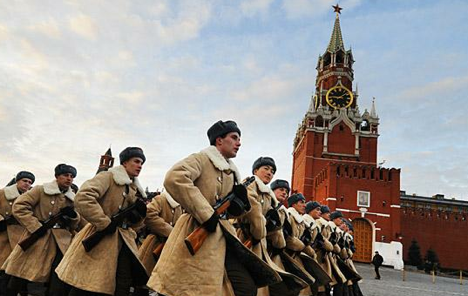 In May 2015 Red Square will host a parade in honor of the 70th anniversary of the victory over fascism. RIR has prepared a special route through the city that encourages visitors to see Moscow through the eyes of ordinary Muscovites that lived through the bombs and longed for victory together with the whole country. This is the terminus of the Aeroexspress from Sheremetyevo Airport. The station’s building was erected under Tsar Nicholas II in 1912. During World War II this was where military convoys left for the front. Soldiers bade goodbye to their friends and loved ones in the square in front of the station. In order to get here from the Belorussky Station take the circle line metro at Belorusskaya and get off at the next station. This station opened just before the war in 1938 and was awarded the Grand-Prix at an international exhibition in New York. During the war Mayakovskaya, like other stations of the Moscow Metro, was used as a bomb shelter. Moreover, on November 6, 1941 it was here that Soviet leader Joseph Stalin said the words “Moscow will stand, the Soviet people will not be broken!” This speech was broadcast by radio to the whole country. According to historian Robert Service, Stalin even lived in the station for a time during the war. During the war it was possible to get food, medical care and even watch films in the metro. At Kurskaya station (on the blue line) there was a reading room with books from the Lenin Library. During the period of intensive air raids against Moscow 15 million people took shelter underground and during the average air alarm 150 new city residents were born. To reach the monument, get off two stations after Mayakovskaya, either at Teatralnaya or Okhotny Ryad. The monument is on Manezhnaya Square next to the entrance to Red Square. Georgy Zhukov, who grew up in a peasant family and wasn’t able to attend the university, managed to become the Marshal of the Soviet Union and soon after the war earned the popular nickname of the “Marshal of Victory.” At the very beginning of the Great Patriotic War (this is how Russians refer to World War II) it was Zhukov’s leadership that stopped the enemy offensive near Moscow, spoiling Hitler’s plan for a blitzkrieg and the rapid conquest of the USSR in just two weeks. “When people ask me what moment of the war I remember most, I always answer: the battle for Moscow,” Zhukov would say. The Monument to Georgy Zhukov was set up in Moscow’s Manezhnaya Square in 1995 to commemorate the 50th anniversary of the end of the war. It is not coincidental that the Marshal is portrayed riding a horse: this was how he saluted Soviet troops at the 1945 Victory Parade. The idea of having him ride a horse was Stalin’s. They looked for a horse all over the country for five days before settling on a silver grey horse nicknamed “Kumir” (idol). Zhukov rode him for an entire month before the parade. To get here cross Manezhnaya Square from the Monument to Zhukov: the sentry post is located on the left of the entrance to Alexander Gardens. This sentry post is located next to the Grave of the Unknown Soldier, although Russians refer to it simply as the “eternal flame.” After World War II memorials to fallen soldiers sprouted up in all Russian cities. Here guards keep watch next to the Kremlin’s walls every day from 08:00 until 20:00 regardless of the weather. The changing of the guard takes place every hour under the rapid flash of tourists’ cameras. During their shift the guards stand still with dedicated rigidity and despite attempts by visitors to make faces, utter strange sounds and tell jokes to these steadfast models of silence, they never move. To get here, go to the Arbatskaya metro station (blue line) and get off three stations later at the Park Pobedy stop. Be prepared for a long walk. The Memorial Complex was opened in 1995 on the 50 thanniversary of Victory Day. The main monument is located in front of the Central Museum of the Great Patriotic War and is embellished with a water complex: five years of war are represented by five terraces surrounded by 225 fountains, the number of weeks the war dragged on for the Soviet people. In Park Pobedy (Victory Park), a unique outdoor exhibition dedicated to military equipment and military engineering is on display. There are more than 300 heavy equipment models belonging to both sides that were used during the war. Park Pobedy is one of Moscow’s largest open-air recreational complexes and is an ideal place for evening walks during the summer months.